Making your own pickles at home couldn’t be easier then with this refrigerator bread and butter pickle recipe. No special equipment is required just some fresh cucumbers (even better if they are home grown!) And a few seasonings. I absolutely love pickles. Perfect on sandwiches or burgers, used to garnish charcuterie platters, served alongside roasted meats, there are so many different ways pickles can be eaten. 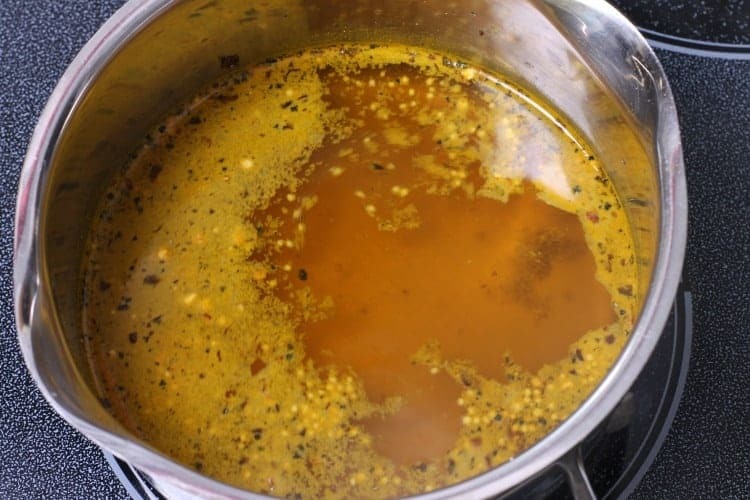 It’s unfortunate that more folks don’t make this easy condiment at home though. 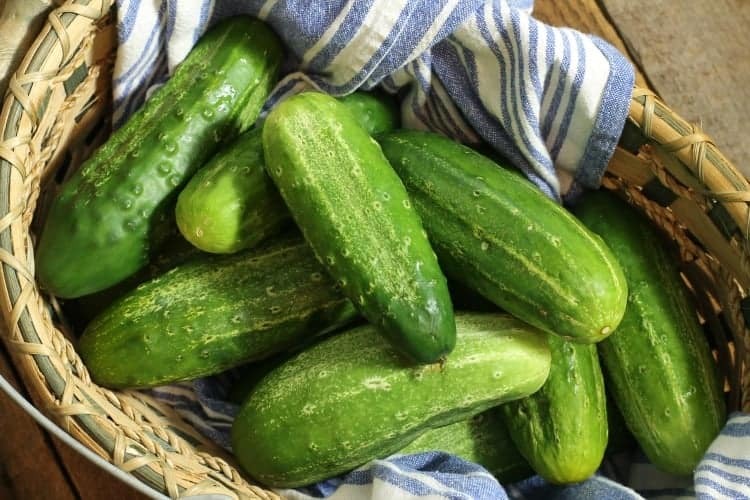 This is likely due to the fact that making pickles is usually a pretty involved process, requiring strict sterilization, specific PH levels, temperatures, and specialized canning equipment. The solution? Making refrigerator pickles at home with everyday cucumbers! Some of the links in this post lead to affiliate sites through which Earth, Food, and Fire may earn a small commission (at no increased cost to you) should you make a purchase. For more info check the Affiliate Disclaimer. What’s The Difference Between Traditional Pickles And Refrigerator Pickles? Traditional pickles are canned. This means they are cooked in a flavored, vinegar, sugar, and spice mixture before being heat processed in mason jars. By processing pickles (or other vegetables in this way) you can preserve produce long past it’s normal expiration date. Anywhere from 1 to 5 years! The vinegar, lack of oxygen, and high heat created in the canning process, creates a sterile environment in which bacteria is unable to grow, preventing food from spoiling. While this is a great way to keep food for long term storage, it does take a bit of work especially if you’ve never canned anything before. If you want to try canning at home, learn more with this intro to canning guide from the creators of the Mason Jar itself! 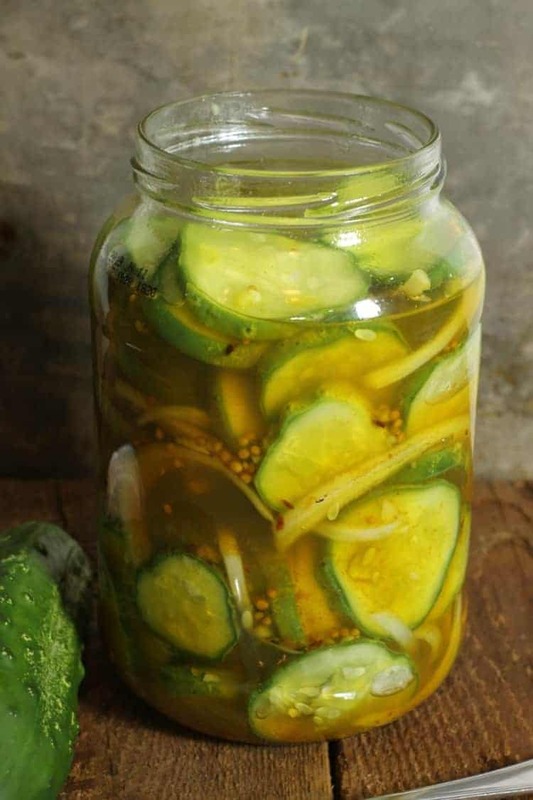 Refrigerator Pickles or quick pickle recipes are essentially marinated cucumbers that are flavored to taste like the traditional pickles we all love. While it’s true that refrigerator pickles also use vinegar, sugar, and spices much like canned pickles do, quick pickles are not heat processed in any way, making them unable to be stored without refrigeration. Fridge pickles rely solely on the high acid content to delay the growth of bacteria, so refrigerator pickles such as these bread and butter fridge pickles will only keep for up to 3 or 4 months under refrigeration. So why would anyone make refrigerator bread and butter pickles at home instead of canning a batch or just buying some at the store? Simple! If you grow your own cucumbers at home, you’ll likely have run into the problem of being over run by fresh cucumbers. The vines can be so productive that unless all you do is eat cucumbers, they will easily go bad before you can use them all. 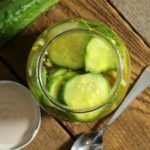 Quick pickle recipe such as this one are fast to do, create an easy and cheap way to preserve your summer harvest for those that do not want to bother getting into the exact science of canning. 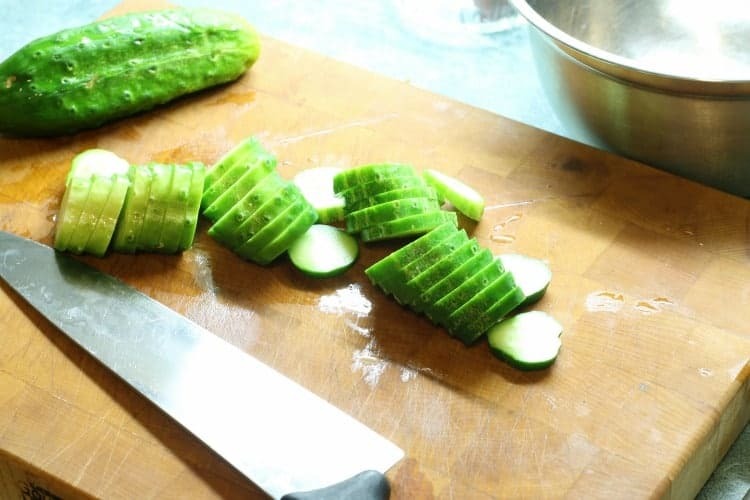 Start by washing the cucumbers, and then slicing them into thin slices. 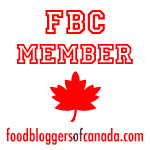 Don’t go too thin, you want to pickles to have a little bit of crunch left after marinating! Julienne the spanish onion and mince the garlic, set the onion and garlic aside. 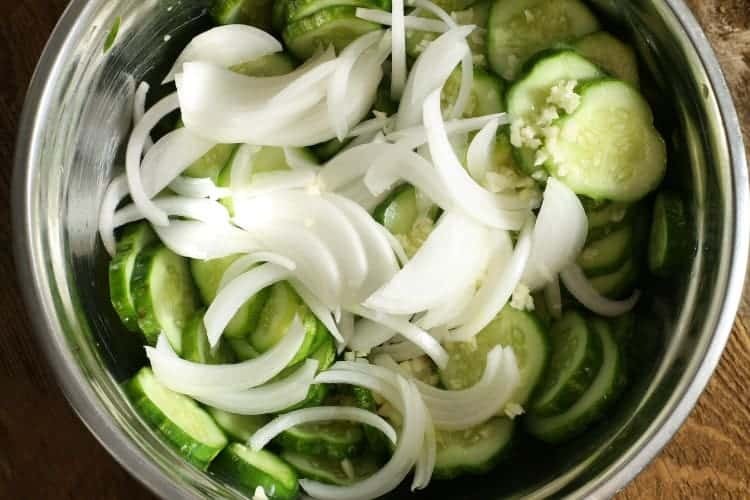 Sprinkle the pickling salt over the sliced cucumbers and mix it in with your hands. Refrigerate for at least one hour. In a small pot combine, the vinegar, sugar, and spices. Bring the pot to a boil and then turn it off, leaving the pot on the hot burnr to infuse the spices into the vinegar mixture. Once the salted cucumbers have sat in the fridge for an hour, strain of any water that has been drawn out of them. Mix in the julienne onion and minced garlic. Pack the cucumber, onion, and garlic mixture into clean glass jars, old pickles jars or mason jars are perfect for this. Bring the vinegar mixture back to a boil, and pour the boiling liquid into the cucumber packed jars. Seal the jars with a corresponding lid, and let the jars cool to room temperature. Refrigerate the homemade quick pickles for up to 4 months in the fridge! It’s best to let the refrigerator pickles sit for three to four days to really let the flavor sink in and the longer the refrigerator pickles sit, the more intensely flavored they will become. 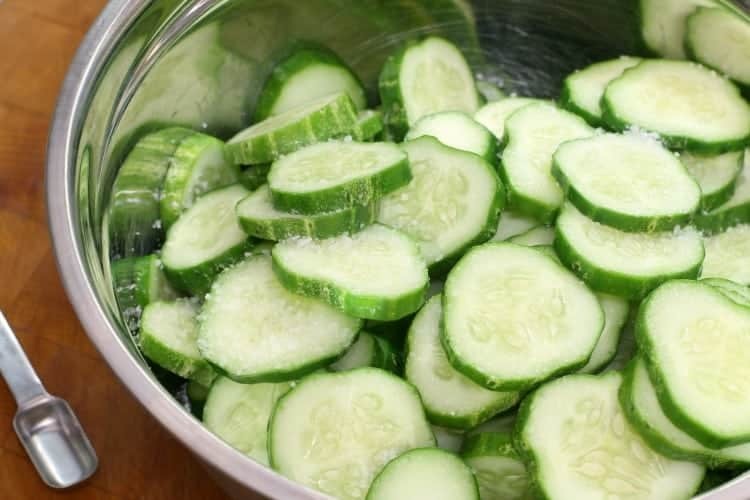 Start by washing the cucumbers, and then slicing them into thin slices. Don't go too thin, you want to pickles to have a little bit of crunch left after marinating! Julienne the spanish onion and mince the garlic, set the onion and garlic aside. I love quick pickles – thanks for sharing your technique and recipe, Markus. I will also have to try your suggestion with cherry tomatoes and baby carrots, too! They are all so handy to have in your fridge. Quick pickling is so convenient and we do it a lot with cucumbers, because, when you grow cucumbers, you can only eat so many, right? This recipe is so good, and reminds me of my late Mom in Law’s recipe. Thanks for sharing. It’s a great little way to preserve garden produce isn’t it!? I also quick pickle cherry tomatoes, and baby carrots, the carrots are great in salads, and the cherry tomatoes are good on their own or in dressings!